There are people around the world for whom a century isn’t an abstract quantity: it’s the life they’ve lived, plus some. My grandfather, whose birthday is August 11, is one of those people. Robert N. Kennedy will spend Thursday celebrating his 102nd year with relatives and friends, trading memories, and reflecting on all he’s seen, done, and learned. There will be laughter. Perhaps tears. Definitely prayers. 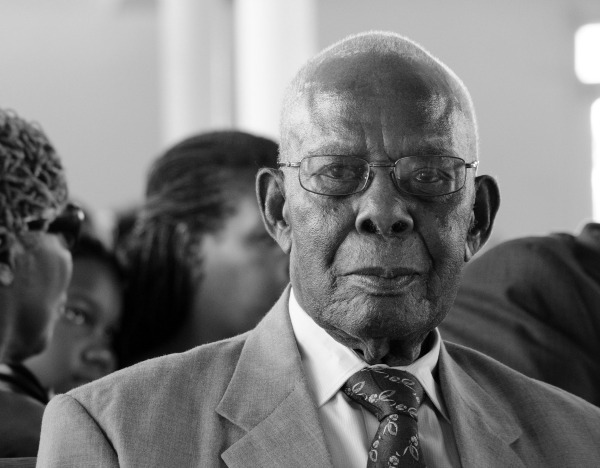 One of his many grandsons took the photo above between church services two years ago in Jamaica, and it captures him in a context that has shaped every one of his last eight decades. When I think about how much memory, experience, and skill a person can amass in a hundred years, I also inevitably think about the absences created when that lived wisdom no longer speaks for itself. When the people who hold experience in their bodies step down or pass away, we don’t lose complete access to them. Instead, we access their experiences through our memories and our interpretations of letters or videos or other artifacts from their lives. Direct relationships become indirect. Conversations become hearsay. Organizations can live centuries long too if they plan their use of resources well, adapt to mitigate crisis, and rise to meet the challenges they face during periods of substantive change. Organizations can also experience the blessings of people with decades of local-context; they have experience and know how things actually work, not merely how they should. My grandmother was our family’s storykeeper: she had a brain for details and tracing connections that might have served her well had she been born in a more recent time or a more talent-nurturing place. Before she died, family members interviewed her and my grandfather about their childhoods and early adulthood, about specific people who’d had an impact on them, and about lessons they’d learned since. I fondly remember hovering around the kitchen counter while Grandma or her aide cooked. I kept safely out of range for doing extra chores, but I also stayed close enough to see her talk to me about her siblings. Which cousins-once-removed belonged to whom? Which great uncle used to whistle while he worked? We can’t do more of this anymore (she passed away in 2011). So many of her stories are lost to the world. But the stories she and her husband have told us over the years? Those we keep. Like families, organizations also have storykeepers, formal or informal. Storykeepers help small groups to retain the thread of identity and impact that runs through not just a given generation but also through those who precede it, and those who’re coming later. The thread of a good story is what helps us avoid the same pothole in the same place time and time again. We need the long perspectives of time to learn well and take constructive action. And we need those who carry their wisdom in their bodies so it’s with them and of service to others wherever they might go.